Visiting friends just before Christmas, we came to talk about how buildings change and the feeling of dislocation that this sometimes brings. The building we were actually discussing was a special case: my husband had worked there for most of his career before it was knocked down and rebuilt. Responding to local pressure, however, the organisation that owned it was constrained to preserve carefully the original early twentieth-century façade (which I’d always thought was very second empire, but was certainly more imposing than any modern constrained-by-budget counterpart would have been), even as it created an entirely new structure behind. Therefore, the new building is quite different from its predecessor in every respect except one: to enter it you have to climb the same flight of steps and pass through the same solid door, flanked by two storeys of massive man-sized sash windows, that gave access to the old one. Beyond, if you remember the old building as clearly as I do, and aren’t very familiar with the new one, you encounter a true Alice-through-the-looking-glass experience. As I’ve said, this rebuilt building presents a special case, but talking about it has made me think about all the buildings I’ve lived in during my life: the three houses in Spalding that were my family homes until I was respectively nine, sixteen and eighteen; my hall of residence at Leeds University and the run-down student flat in Leeds that I subsequently shared with my closest friend; the rather grand flat where my husband and I lived during the first few months of our marriage, before we were ousted by a greedy estate agent who wanted to triple the rent; and the subsequent three houses that became our own family homes – the humble two-up, two-down 1939 brick box in Chapel Allerton, the much more substantial Edwardian semi in Halton and our present house that is tucked away in a picturesque Pennine village. All of these buildings are still standing. Some will have known many owners or tenants since I lived in them; some have been refurbished; others have sunk yet further into dilapidation. As far as I know, none except my present home still contains any imprint or vestige of myself. I have revisited most of them at long intervals, but I haven’t been inside a single one of them since they ceased to be ‘mine’. 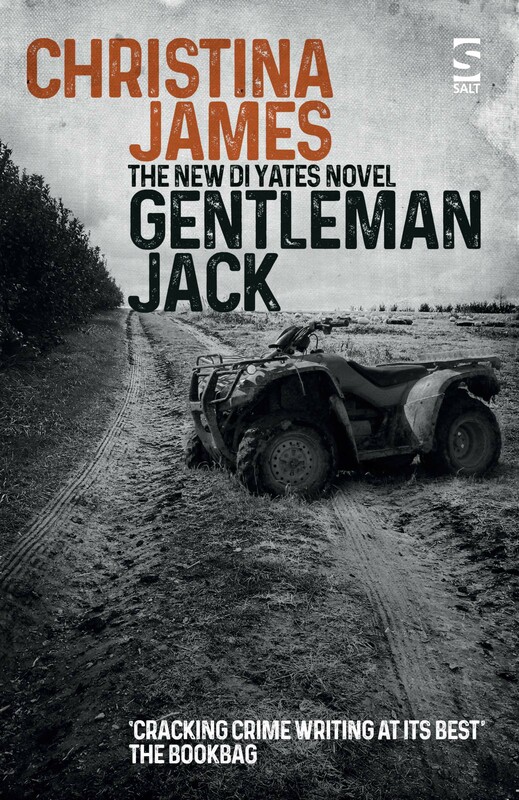 Recently, after I began to write the Tim Yates stories, I deliberately went back to the site of the shop in Westlode Street, Spalding, where my great uncle David worked for his whole life (it is now a café, run by eastern European immigrants) and also parked for a few minutes outside the mid-nineteenth century house in Sutterton where my grandmother lived and worked as a paid companion when I was a child and where most of the third novel in the Tim Yates series – the one I am still writing – takes place. I didn’t go into the café for a coffee because I wanted to remember the shop as it was. I almost (but not quite) plucked up courage to ring the doorbell of the house in Sutterton (it was, after all, more than forty years since I was last inside it), but again I decided not to, and not only because I realised that the present occupants might not appreciate having to entertain an eccentric woman brimming with nostalgia on their doorstep. It was also because I’m still writing about this house and I want to remember it exactly as it was. I don’t subscribe to theories that represent time as anything other than a linear continuum (though I know that serious scientists have begun to argue otherwise); nor do I have conclusive proof that buildings have memories (though I could be persuaded to believe this: I’m certainly convinced that some buildings exude a powerful sense of atmosphere). Yet still I am intrigued by the fact that all of these buildings have continued to lead parallel lives to mine: they have grown older as I have grown older; like me, they have made friends, good, bad and indifferent, who have treated them with kindness, indifference or malice along the way. If I could return to them now – really return, to be given the opportunity to explore every room, every cupboard, every fireplace – or, in some instances, either to wonder or lament at ‘improvements’ that have meant that the rooms and cupboards and fireplaces that I knew are no more – that would be a looking-glass experience much more fundamental to what has shaped me as a person than my occasional, albeit eerie, walking beyond the façade of the building that became my husband’s new workplace. As I’ve said before, place is important to me… and one of the lynchpins of my writing. I remember the places I’ve lived at, stayed at and passed through very clearly. If I could have alternative, updated views of what, for me, have been the most significant of these, I wonder if I would find it an unsettling or an enriching experience, or both of these things? And, even more, I wonder what effect it might have on the store of memories on which I rely when I am writing. Sorry, Michael, for my previous prejudice… may I make amends! 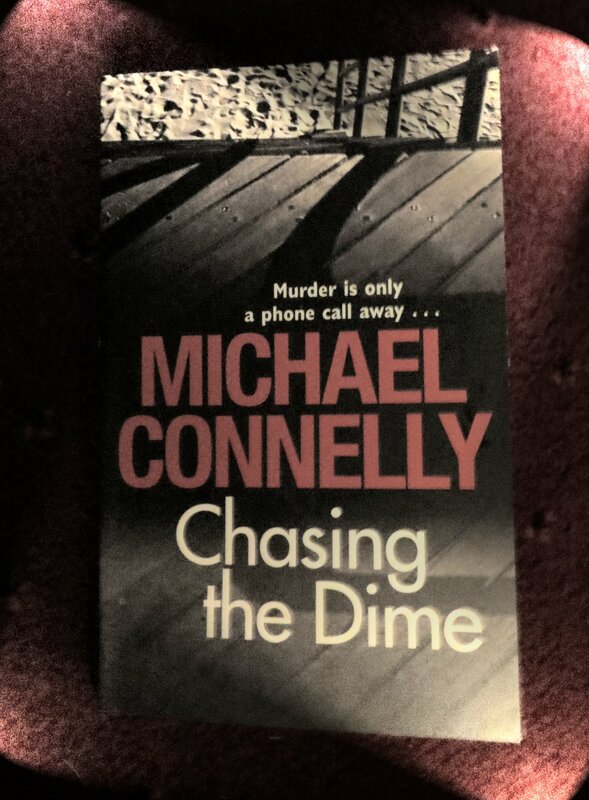 I am going to start this review with a confession: although I have been given several books written by Michael Connelly and even lent them to my friends, Chasing the Dime is the first one that I have read – and, ironically enough, I bought it at a book sale in a Co-op supermarket near Oxford, because I’d run out of things to read. Normally, I wouldn’t buy books from a supermarket because I believe in supporting local bookshops. So, two firsts in one go! The reason I’ve not read a Connelly novel until now is that, and my ignorance is pretty unpardonable, I’d been led to believe him to be the kind of blockbuster author in whom I’m least interested: big-picture, change-the-world sort of stuff (x saved the world single-handed from the next atom bomb, Hermann Göring, Nuremberg and suicide notwithstanding, has been alive and well in South America for the last sixty years and running drug rings, that sort of thing). Chasing the Dime is not like that at all. Instead, it is one of the most perfectly-crafted murder stories that I’ve ever read. There’s the background, for a start. The hero, Henry Pierce, runs his own R & D company. It is conducting research into molecular computing, in a highly competitive sector where several other companies are also in the race to crack the conundrum. Their mission: to create a computer the size of a dime. Hence the title – but the title also reflects the company’s need to find sponsors and also, sadly, refers to why beautiful young women are forced to prostitute themselves. (The title is one of many aspects of the book that works on several levels.) I’m sure that when Connelly wrote this novel (it’s now well over ten years old), there was a race to bring such a molecular computer to the market in just the way that he describes, but it says a lot about his talent as a writer that, although during the course of the novel he reveals many facts about the complex technology involved (and has clearly mastered what these are), he never obtrudes knowledge on the reader in such a way that this information seems to be anything other than an integral part of the story. Few writers can pull this off. Then there’s the plot. Henry’s obsessive research has just caused his girlfriend to break with him. Henry moves into a new flat, for which his PA acquires a new telephone number. The problems start straight away: the number had obviously previously been allocated to a call-girl. Because of certain facts in his past – which Connelly allows to emerge at enigmatic intervals throughout the story – Henry decides to find out the identity of the call-girl and what has happened to her. Owing to several rash but perfectly understandable (from the reader’s point of view) decisions, he quickly becomes a murder suspect. I won’t say any more, for obvious reasons. However, I’d add one further thing: nothing in the plot is incredible; there are no fantastic twists or turns and not much transpires in a way that the reader can’t guess; yet, because of Connelly’s psychological insights and his fast-paced but not too whacky writing, the reader is held, spellbound, until the last page. I owe Michael Connelly an apology for doubting him for so long. As it is, I shall do ‘penance’ in the most pleasurable of ways: by reading the rest of his novels in short order. You will, I’m sure, be lining up to tell me that his Harry Bosch series is a must-read and roundly ticking me off for my shocking prejudice. It is Christmas Eve, so I’d like to take the opportunity to thank everyone who has read this blog and supported it with so many kind, helpful and insightful comments over the past year. It has been my very great pleasure to have ‘met’ you in this way and I feel extraordinarily humbled that you have spared the time to take so much interest in me and my writing. For those of you who celebrate Christmas and for those of you who don’t, I’d like to wish you a very happy and relaxing time and a spectacularly successful New Year – wherever you are and whatever you are doing. If you are a writer, I wish you some of that elusive luck that all writers need. P.S. The blog-posts have been a little erratic in recent weeks, as I’ve been away a lot. I shall try to do better as my main New Year’s resolution! However, I’d like to share with you that the day-job is taking me to China in the first full week of the new year, so they may be a bit thin on the ground then – though you can be sure that I shall recount my experiences in as much detail as you can take afterwards! Last Friday, I spent another fascinating evening at Rickaro Books. I’d been looking forward to it with great anticipation since the Ian McMillan / Tony Husband event that took place several weeks ago. 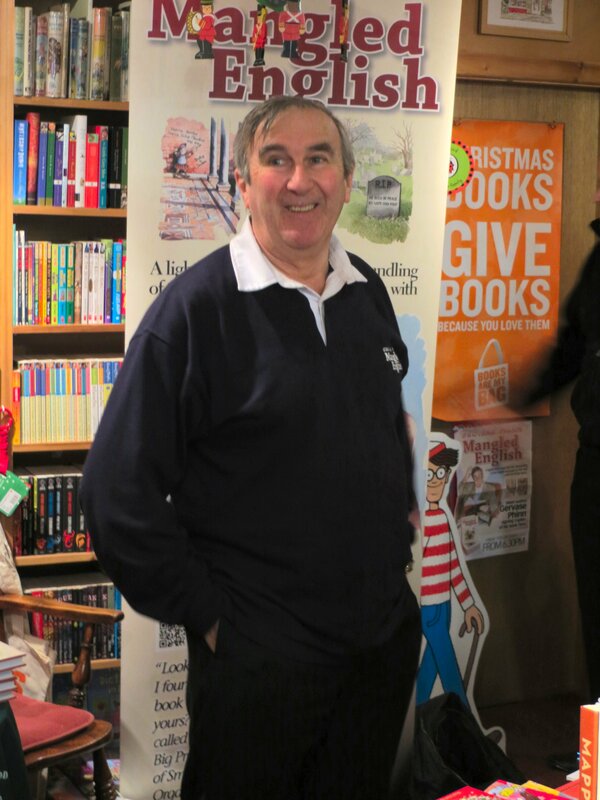 This time, the author was Gervase Phinn. I hadn’t met him before – though my husband is very familiar with his books – and he did not disappoint. The event was extremely well attended: I calculate that at least forty people managed to squeeze into this distinguished but pocket-sized bookshop. In a more serious vein, Gervase extolled the virtues of encouraging children to read at a young age – as he had himself been encouraged as a boy – and deplored the government’s ever-changing education strategy. As a former inspector of schools, he is better qualified than most to do so. He took an especial interest in the children at the event. It was a privilege to meet him and I had two opportunities to talk to him. However, the best part of the evening for me was actually being at Rickaro Books itself, looking at the excellent rare books collection that is on sale there and drinking mulled wine – it was the gateway to Christmas for me, in fact. The experience was made even better by being invited to join Richard and Carole Knowles, the proprietors of the bookshop, for dinner afterwards in their local Italian restaurant . 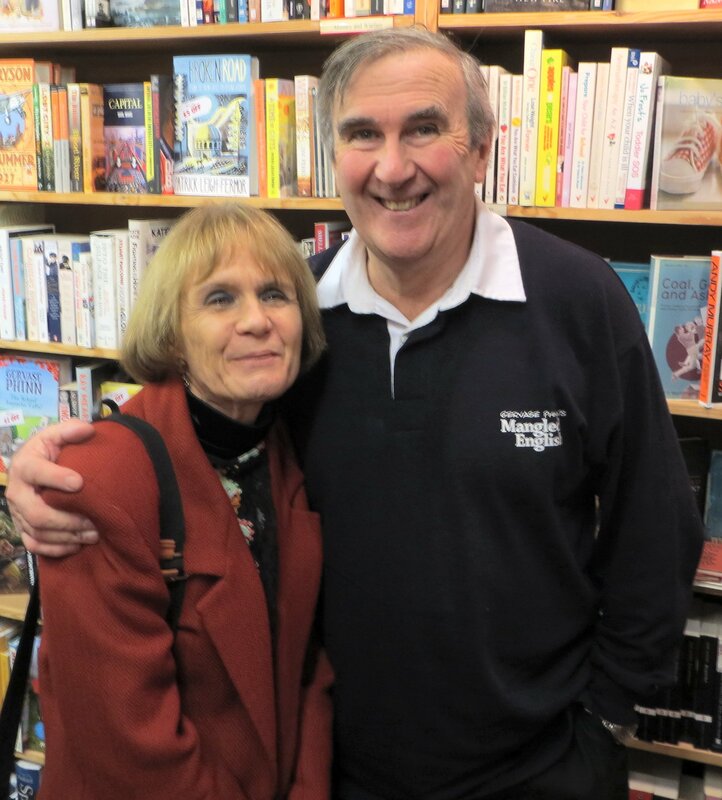 As I’ve said in a previous post, Richard and I go back a long way, and it was very good to have the opportunity to listen once more to his (sometimes elliptical, always amusing) take on life, the universe and bookselling… and to get to know Carole a little better. Watch this space: I’m sure that there will be more posts about Rickaro Books in the future. Should you ever be in Horbury, I wholeheartedly recommend that you take a detour (it won’t be much of one, as the bookshop is in the very heart of the town) to pay a visit. 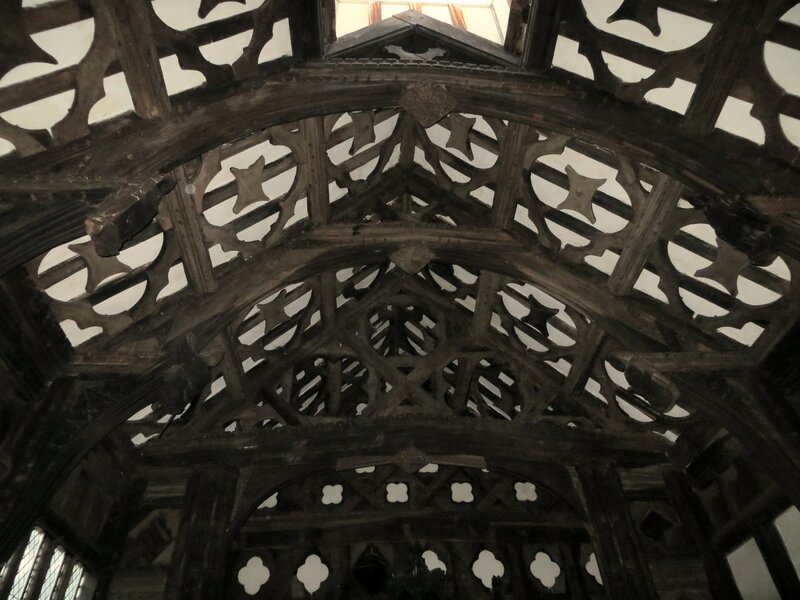 Rufford Old Hall – Great Hall screen – fingers! After bouncing round the country like a yo-yo for ten days, penetrating some of the less glamorous outer reaches of bookselling (Don’t ask: it’s nothing you’d ever see on the high street! ), on Saturday we spent another wonderful day with Priscilla and Rupert in Lancashire. 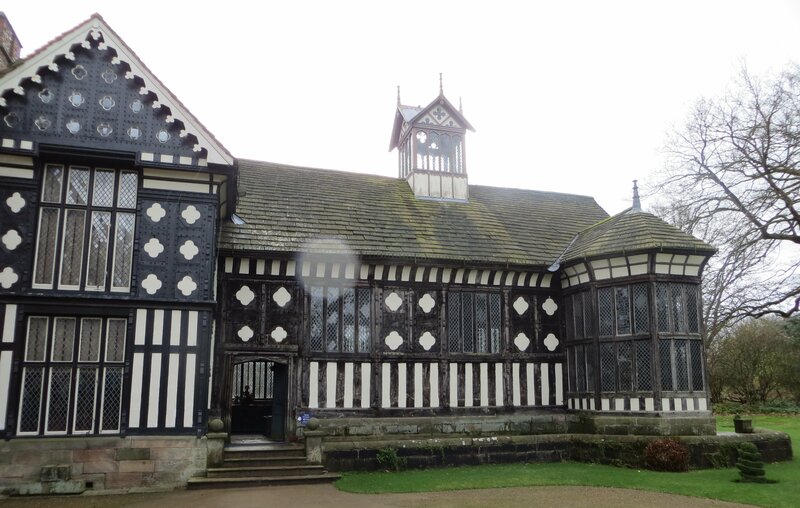 This time our walk – with two frisky dogs – entailed walking across fields and along a canal bank to Rufford Old Hall, a fine Tudor building. This in itself was a great treat. An Elizabethan manor-house, it made me realise that, if I could return to the past, I’d have no desire to be a great lady (fat chance – I’m sure all my ancestors were peasants, probably of the most primitive kind; my family name actually means ‘sheep-shearer’ and we are all squat, blue-eyed Saxons, not tall, interesting Normans, fiery, red-haired Danes or exotic, white-blond Flemings). But I digress. I’d have no desire to be a great lady, at the mercy of political fortune, likely to have a husband who would either leave me for long periods while he fought in wars (expecting me on occasion to raise militia to protect our estate), or be obliged to entertain the monarch on a tour of ‘progress’ and therefore invite my own financial ruin. It would have been much pleasanter and more settled to have been one of the fortunate Hesketh family, who owned Rufford for many generations, and lady of the manor of a substantial but not pretentious house like theirs. When we visited, the upstairs of the house (which is now owned by the National Trust) was being renovated and therefore out of bounds, but the downstairs, including the wonderful Great Hall (which is not too ‘great’ to be cosy when lit by an open fire) and various rooms of later dates, was open to the public. 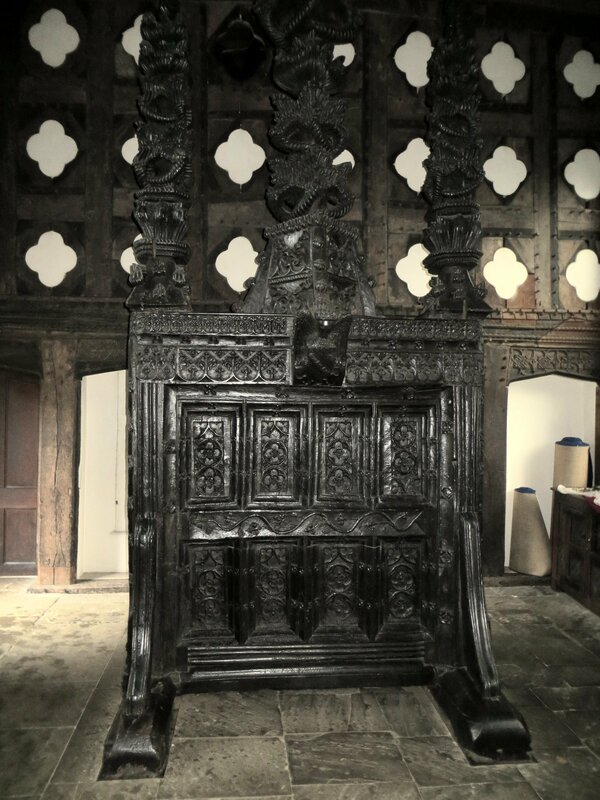 I was especially fascinated by the screen at the entrance to the Hall, the only survivor of its kind, which acted as a joint draught-excluder and obscurer of servants bearing away unsightly dirty dishes. 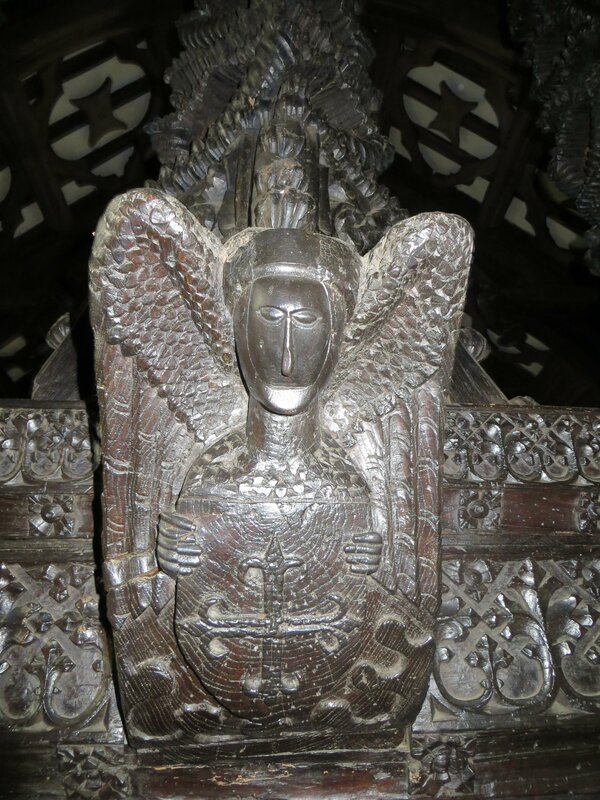 It is a beautiful piece of carved oak, complete with quirks that say so much about the early Heskeths who commissioned it: for example, one of its panels is upside down and one of the angels it depicts has a supernumerary finger: A tribute to Anne Boleyn, also supposed to have had this ‘blemish’ (which was later produced as evidence that she was a witch)? Or, more probably, an observance of the mediaeval belief that no work of art should be perfect, lest it offend God? Also intriguing was the signature carved in the original Elizabethan glass of the bay window of the Hall, dated 1513 (so it was five centuries old this year). I’d love to have met its author! The National Trust guardians of the Hall were sympathetic, cheerful folk, not at all forbidding or restrictive, as some of their counterparts at other NT houses have been. They’d decked the Hall to celebrate Dickens. Placards with quotations from A Christmas Carol were everywhere, and the guides themselves had dressed up in mid-Victorian garb. And so back to Priscilla and Rupert’s, to sample their sloe gin and blackberry brandy: the good life, indeed, and the best foretaste of Christmas we could ever have dreamt of! Not forgetting a trip to see the huge willow tree that the weather had part tumbled and Rupert had finished off, at great risk to his life, while Priscilla was in bed with ‘flu. What is it about men and trees? Never mind OK lumberjacks in high heels: it seems to me that every man contains within his soul a death-wish – not just a desire to perish in any old way, but by having a tree fall on him, or (to me) worse horror, by means of a chain-saw or axe. Fortunately, although Rupert fell fifteen feet, he survived with a few scratches… and suffered more from the (just) excoriation of Priscilla’s wrath. I feel I haven’t done full justice to male folly and trees in this post: I’ll come back to it again. Remind me to tell you of a monster ‘useful piece of hardboard’; of Fred (of bird impersonation fame), thirty feet up a ladder, his grasp firmly around the top of a tree he was in the act of chopping off; of Ken, who made our dining-room table, almost sawing off his index finger ‘by mistake’! Once again I am on a train travelling south to London, and once again it is winter. I’ve made this journey many times since I last wrote about my fellow-travellers in January, but today it is quite cold outside and the people who have crowded on to this train are much more reminiscent of my January acquaintances than any I’ve encountered since. Today, the people travelling in first class (it is very cheap on this service) are lively and cheerful. Most are talking to each other animatedly, so there is less scope for me to guess about their backgrounds or attribute murderous motives to them. Some are clearly business people, but many are going to London for a day out, to shop for Christmas. Several appear to be families engaged in both activities: the man (or woman) poring over spreadsheets or reports while other family members chat noisily over his or her head. One conspicuous difference at this time of year is that all the blocks of four seats around the large tables are taken. The ‘airliner’ seats for one, each with a smaller table, have mostly been shunned. I love the airliner seats, which are usually in heavy demand, but today I feel anti-social, sitting here in solitary splendour tapping away at my laptop. The most extraordinary thing about these pre-Christmas travellers is that not one of them is glued to a mobile phone. There are no raised voices enunciating “I’m on the train”, intruding upon others’ thoughts with infuriating penetration; no ever-so-busy women spending the time from when they board the train at Doncaster to when they get off it at King’s Cross systematically calling everyone in their address book (it’s surprising how often my journeys have fallen victim to one of these); no raucous men calling their mates to reminisce about having had a few too many the night before. The only thing that disappoints about this group – and the disappointment is a big one – is that not a single one of them seems to me to be likely murderer material. I realise that murderers come in all shapes and guises, but they have one thing in common: if they’re not being paid to kill, they exhibit some kind of negative excess. All are excessively desperate, or vengeful , or greedy, or deranged. It is hard to believe that any of these joyful, excited people now sharing the carriage with me harbours such qualities with sufficient intensity to be transformed to a killer. So what shall I say about them? Guessing what they’d like for Christmas might be fun. I’ll start with the easy ones. The two femmes d’un certain age sitting opposite me are both swathed in expensive scarves: one sports a bright red pashmina-style creation with tassels, the other a svelte black velvet cravat discreetly patterned in silver. If they buy presents for each other, I’m sure that it will be festive scarves again. Again? Well, the ones they’re wearing were probably last year’s reciprocated presents. The man at the next table, still hunched over his report as his wife and two teenage daughters chatter and wave their arms, is making occasional notes with an ancient, chewed biro that looks as if it might have started life as a promotional gift from Kwik-Fit. If he really has to toil so hard for the whole journey (and is not just taking the soft option by ignoring his family), I feel that he deserves a decent pen. 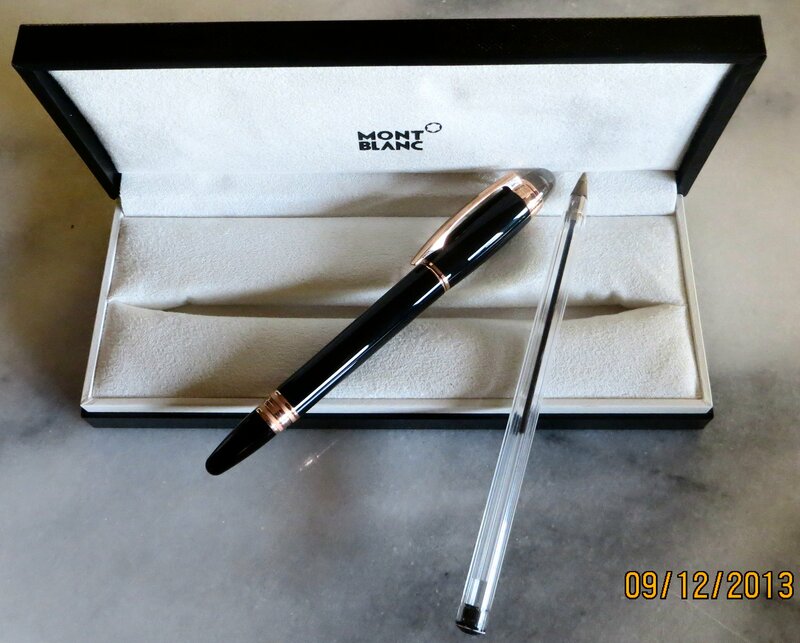 A Waterman, at least, if not a Mont Blanc. The two girls, both dressed in gauzy tops with lots of silver jewellery, huge eyes accentuated with expertly-applied make-up, are probably expecting to receive more of all of these things… and a lot more besides. The elder looks old enough to drive …. so Dad probably does need to keep on with the grafting. His wife, fingertips nail-barred to perfection, is sporadically reading on her Kindle between joining in the laughter and the chat. I doubt that Kindle vouchers will hack it for her, though. She, too, is wearing jewellery, much less than her daughters, but items of a different order from theirs: two sleek rings, one with a diamond embedded; a slender gold necklet; studs in her ears, which look suspiciously like diamonds. Her watch is probably gold, though mounted on a plain black leather strap. I’m sure she’d like an upgrade: a new gold watch for her, complete with a gold bracelet this time, please. Time to hazard a guess at the tastes of the more inscrutable passengers now. The three companionable men sitting together: what would they like? They don’t look like football fans and, mercifully, aren’t discussing sport. One is reading the paper; one (I’m pleased to say, silently) listening to music; one sipping coffee and looking out of the window. No clues there. I could award them all new boxers and socks, but it wouldn’t be very enterprising of me. I think I’ll take a risk and give them all tickets for a murder mystery weekend. I know that Walton Hall, near Wakefield, has a couple coming up. I might even go to one of them myself. I may not be able to spot any latent murderers on this train, but there’s no harm in getting some of its occupants into the right frame of mind. 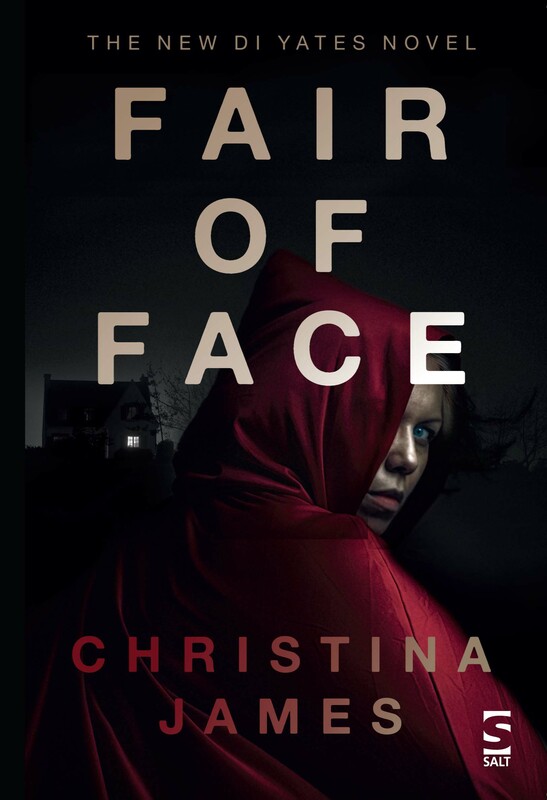 I’ve always thought it a great paradox that there’s no better way of relaxing than with a good crime novel. I don’t know why this should be; it is perhaps because reading about murder and mayhem, trickery and treachery helps you to appreciate the safety and security of your own world and to put all the people who’ve annoyed you during the course of the working day into perspective: a perspective reinforced also by all the ones who’ve been especially helpful or kind (as there are many more lovely people in the world than crime writers acknowledge). I read voraciously all the time and I like to alternate reading fiction with non-fiction, sometimes having two novels and two non-fiction books simultaneously on the go. My preferred non-fiction subject categories are biography, memoirs, natural history, (more selectively) geography, particularly of Lincolnshire and Yorkshire, archaeology and history. Especially history. I love local history (again, particularly of ‘my’ two counties, as I’ve mentioned before), but I read history books about all periods and places, all of the time. Coming back to what is most relaxing, I think that nothing can beat history books about the high middle ages – perhaps because, just like crime novels, they tell of appalling acts that are remote enough to reassure the reader that he or she is unlikely to experience them first-hand, whilst offering the opportunity to drink up the excitement that they offer. 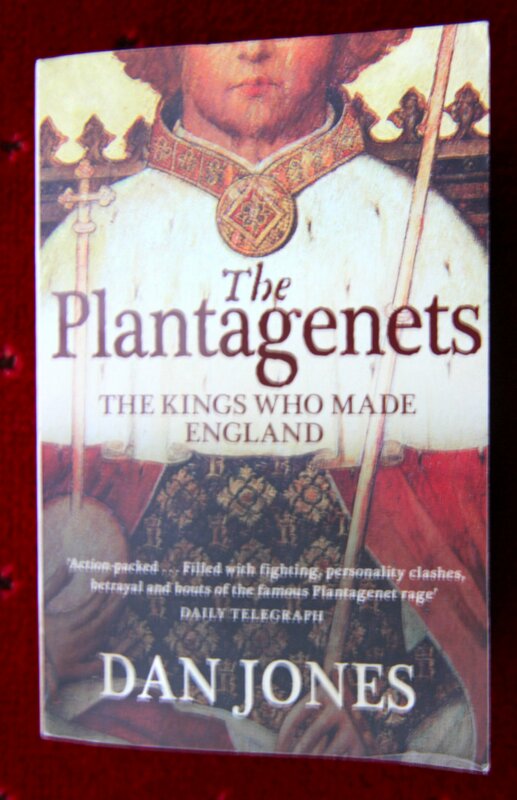 I’ve read many more books about the Wars of the Roses than any other mediaeval period, so in my most recent expedition to a bookshop (it was Waterstones in Leeds) I decided to buy Dan Jones’ The Plantagenets: the kings who made England. I have read accounts of individual reigns in the Plantagenet period, but until now I’ve had no broad overview of it. Jones’ book turned out to be the ideal choice for this purpose. He succeeds superbly well at explaining how each Plantagenet king built on the heritage of his predecessor to make England a strong, united country (they also enjoyed modest successes in Wales, made almost no headway in Scotland and none at all in Ireland) with well-defined laws. Despite the fact that, at the beginning of the Plantagenet period, in the mid-twelfth century, the English king and nobles also held vast swathes of land in France and by the end of it, two and a half centuries later, almost all of these had been lost, the Plantagenets also transformed England from being an impoverished country largely ignored by its European counterparts to a prosperous land and international force to be reckoned with, whether for peaceful trading or highly aggressive warfare. As with all dynasties that span long periods of time, the Plantagenets had their failures as well as their successes. The greatest Plantagenet kings were Henry III and Edward III; the weakest were Edward II (who was spectacularly incompetent) and Richard II (who was less so, but like Edward II failed to understand the dangers of empowering his favourites). It was directly owing to Richard II’s shortcomings that the great Plantagenet dynasty fell. No less fascinating are the Plantagenet queens: they may have been consorts rather than rulers in their own right, but such royal wives as Eleanor of Aquitaine, Eleanor of Castile and Isabella of France were every bit as colourful, determined – and fierce – as their husbands; in each case, they were the de facto monarchs of England for significant periods of their husbands’ reigns; and in each case they defied their husbands at crucial junctures, often changing the course of history in the process: for example, Isabella of France was directly responsible for deposing the insipid and unkingly Edward II and placing Edward III on the throne instead. She and her lover Roger Mortimer then tried to manipulate the new king, a ploy that failed because Edward reasserted the power and pride of the Plantagenet line in all its pomp and glory. Mortimer was executed; but Isabella carried on enjoying full regal honours as the king’s esteemed mother. One queen for whom I did feel pity as I was reading was Berengaria of Navarre, Richard I’s plain and neglected wife. He seems to have married her simply because he was determined not to marry Alice of France, to whom he had been betrothed as a child but who had probably been seduced by his father, Henry II. They had no children: there is some evidence that Richard was a latent homosexual (though Jones does not subscribe to this theory). I enjoyed this long book hugely. I have a few reservations about it: one is the portrayal of Richard I himself. Jones seems to have accepted the version of him traditionally peddled to primary school children, of a brave and warlike king who brought honour and renown on his country by fighting against Saladin in the crusades. Most works of scholarship now concur that it was irresponsible of Richard to abandon his country and run up huge debts, especially as he knew that his brother John would make a weak, self-interested king. Jones also uses certain phrases irritatingly frequently: the one that grated on me the most was ‘smacks of’, which he uses in the sense of ‘seems to be’. This is not how I would use this phrase myself, but, even if I agreed with Jones’ usage, I’d still like to see this figure of speech appear less frequently. But these are minor quibbles. The dark, cold winter nights are upon us now. If you want to take a break from crime, but still want something thrilling to read that will absorb you totally in adventure and happenings stranger than fiction, this book is for you.